Considering that Lexmark is such a big name in the world of business printing, the X4550 feels surprisingly flimsy, with a build quality that doesn't seem to match the competition. We can't see this device remaining in one piece for long under heavy office conditions. Its main claim to fame is that it's fully Wi-Fi compatible straight out of the box, and in our tests this proved quick and easy to set up. 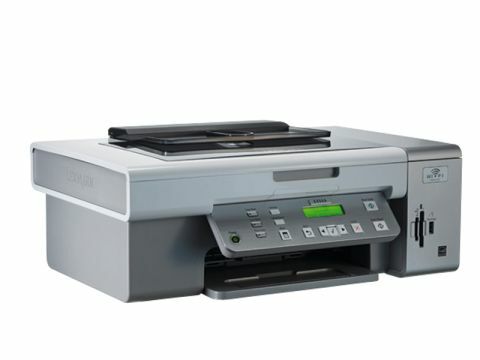 Printing from laptops or other wirelessly connected computers from anywhere around the home is certainly a luxury, but crucially the Lexmark fell short of expectations in other areas. Using the standard capacity ink cartridges supplied with the printer, ink costs are fiendishly expensive, at over 5p per mono print and nearly 12p for colour. Even replacing these with high capacity cartridges only brings the cost down to 3.7p per mono print, making it twice as expensive to run as either of the Canon printers on test. The X4550 is reasonably swift for mono output, but switch to colour and things slow down dramatically. In our tests a single colour DTP page took around three times as long to print or copy, compared with some of its peers. Photo prints were similarly tardy, especially when switching to Lexmark's optional photo cartridge for a six-ink line-up. Finished prints weren't worth the wait, either, with poor colour rendition and tone. Scanning is an equally lacklustre affair and while there's a built-in media card reader, there's no colour LCD, so you have to print off an index sheet of images before you can even choose which photos you want to print. Overall, it's another average performance from the people at Lexmark.